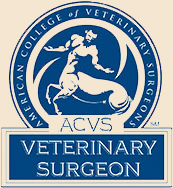 We are very proud to have a talented group of the very best veterinarians in our region. Please feel to contact them with any questions that you might have through our office. Each vet is accomplished in his/her practice and specializes in specific portions of veterinary medicine. Our veterinarians spend many hours each year attending educational seminars, meetings, and conferences to further their knowledge in the care of pets. This allows them to provide the best care to your pets. Dr. Chris Hartwig is originally from a small town in Minnesota near the Twin Cities. 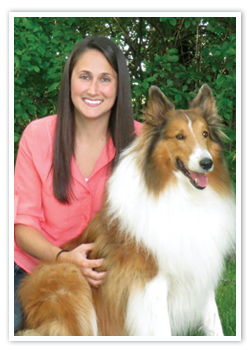 She attended the University of Wisconsin - River Falls and the University of Wisconsin - Whitewater before graduating from veterinary school at the University of Wisconsin - Madison. She has been practicing at the clinic since graduating in 1997. 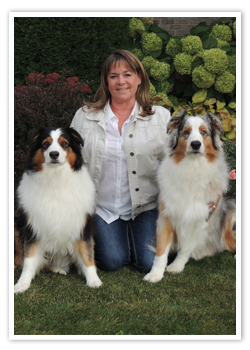 Dr. Hartwig enjoys all aspects of the veterinary field especially her interactions with pets and their owners. Special areas of interest also include surgery, cardiac medicine, ultrasound and rabbit medicine. Dr. Hartwig is an official veterinarian for the House Rabbit Society of Wisconsin and volunteers her time and services to Fellow Mortals, a wildlife rehabilation center. Dr. Hartwig and her husband Scott, who is the clinic's Practice Manager, have three adult children - Kevin, David, and Dana and two grandchildren. They also have two Australian Shepherds named Jackson and Odie, and three cats - Wheezy, Cuddles and Mitten. In their free time, they both enjoy hiking, gardening/landscaping, traveling, and riding their horses. Dr. Kevin Hartwig grew up in southeast Wisconsin and attended University of Wisconsin-River Falls where he recieved his B.S. degree in Biomedical Science. He graduated from St.George's University School of Veterinary Medicine, located in Grenada, West Indies, and completed his fourth year at the University of Georgia in 2011. Dr. Hartwig enjoys many aspects of small animal veterinary medicine and surgery including internal medicine, oncology, soft tissue surgery, and diagnostic imaging, Dr. Hartwig has experience in many different routine and complicated soft tissue surgical procedures. Dr. Hartwig has completed many hours of training to provide DLVC with comprehensive diagnostic ultrasound evaluation of cats and dogs. Dr. Hartwig has been practicing full time at DLVC since 2014. Previous to this he worked part time at DLVC since 2011 while working and living in downtown Chicago. 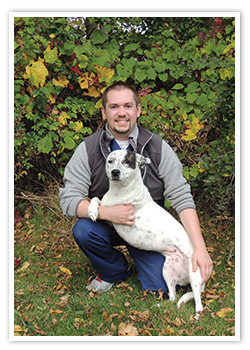 Outside of the clinic, Dr. Hartwig enjoys traveling, sports, and spending time with his wife, daughters, and their three-legged dog, Ashland. He also enjoys tending to his saltwater reef aquarium residing in the lobby of DLVC. Dr. Stengel (formerly Dr. Sdano) grew up on a hobby farm in Southeast Wisconsin, where she cared for a large variety of animals and developed her dream of becoming a veterinarian. She received her bachelor’s degree in wildlife ecology from the University of Wisconsin-Madison in 2011. She then attended veterinary school in Madison, graduating in May 2016. Dr. Stengel enjoys all aspects of veterinary medicine, but has a special interest in animal behavior, dermatology, and dentistry. In her free time, Dr. Stengel likes to spend time with her pets including Nikita, a very special Siberian Husky born with leg defects, Riley, a Collie/Sheltie mix, her two cats, Romeo and Saphira, and her bird, Princess. Dr. Stengel also enjoys riding her horses, traveling, any outdoor activity, reading, drawing/painting, and spending time with her husband, Kyle. Dr. Stengel loves being a part of the DLVC and cannot wait to meet each of you and your furry companions! Dr. O’Brien graduated from the University of Florida in 1987. After completing a three-year residency in small animal surgery at Tufts University School of Veterinary Medicine and Angell Memorial Hospital in Massachusetts, Dr. O’Brien was accepted as a Fellow in Surgical Oncology at Colorado State University of Veterinary Medicine in 1993. Dr. O’Brien has extensive small animal surgical experience. She spent eight years in Southern California, two years in Wisconsin, and then moved to Colorado and Wyoming, where she opened a mobile veterinary surgery practice known as Orchard Road Veterinary Surgery, Inc. 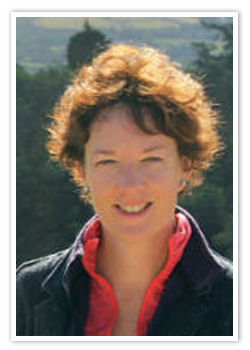 In 2006, Dr. O’Brien relocated her mobile surgery practice to Madison, WI. Over the past several years in Wisconsin the practice has grown and currently offers its surgical service to more than 50 veterinary hospitals in south central Wisconsin. As a board certified traveling surgeon, Dr. O’Brien has been performing a variety of advanced orthopedic, neurological, and soft tissue surgery here at the clinic on an ‘on-call’ basis for several years. Dr. O’Brien enjoys horseback riding, gardening, and spending time with her people family and her pet family of dogs, cats, and horses.